It all began in November of 2006. My son Jonathon, who at the time was 21 years old, talked me into flying back home to Indiana to make a 3D monkey cake for my great niece. She was turning 2. I didn't know anything about cake decorating. My son is very artistic and loves to cook and bake, so does my 3 year old grandsugar Braeleigh. She is my sons daughter and is entering her very first cake into a competition this October in New York. Her little sister Raine is only 9 months old and we hope she follows in our footsteps as well. I went with him for this cake challenge and it changed the course of my career. Since then I have attended every Wilton cake decorating class offered and received my certificates. I graduated in all areas possible and am now decorating and baking for a living. 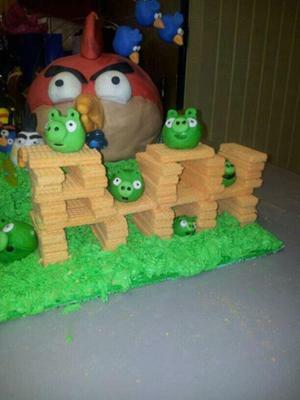 I was asked to make this angry birds cake was handed to me from my best friend Tammy Sanders. It was going to be presented to her daughter Abby who was turning 12 yrs. old. She loves Angry Birds so we got online and checked this funny game out and studied it to the finest details and then started on the cakes. Your standard vanilla cake with pudding added. The moister the cake the better it will stick and hold together. I made sure to study my pictures and came up with my own design, then made a list of all materials involved. Wilton coloring is what I use for the simple reason that Walt Disney or any other licensed character you make needs to be the correct. I baked one sheet cake and icing it with green icing then went back over it with the tip with many tiny holes in it for the grass effect. This makes it easier to make the grass look very green and lush. Then I baked 2 half balls and put buttercream icing between them and sandwiched them together and sat it aside. I colored the fondant in red, orange, yellow, black,green, blue and saved some just plain white. I covered the big ball in red and made his rooster hair and orange beak. Then all of the bird figures and pigs were made. The fondant figurines set over night and hardened up. Then I assembled the whole thing at the event. i transported all fondant figures in a large pan for traveling. Try to get to the events at least 1 hr before so I can set up the cake with no interruptions. The last thing you want to do is to get all stressed out when delivering and setting up your cakes. This will help to ensure that the customer is happy with the finished cake. Word of mouth is the best advertisement. If your customer is not happy, you will not be happy. I put the big red bird in the corner of my green grass sheet cake. Then the vanilla cookie wafers on the end to make the construction part of where the green pigs are placed. Put all the bird characters where I want to be placed and lastly I made a brown bean flipper out of tootsie rolls. Thanks to my daughter Lauren who said it is wood color and would hold up great with some sour fruit roll ups (yellow) for the rubber band part. I placed it behind the red bird for support as well as the 3 wires for the blue birds which was placed at the ends of the wires and the other ends into the green sheet cake. 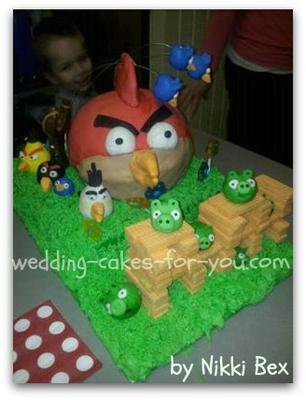 I feel anyone can make an amazing cake with fondant when using materials as wood, cardboard, metal and ect. If you can pull off a fully edible cake, then you have the makings of a great cake decorator. Make sure you have a back up plan in case some pieces break. I make up two of each to take and I make them at least 4 hours earlier if not the night before to give them a chance to dry and harden. I love to work with fondant and gumpaste it's my favorite medium. That's why we make 3D cakes that smoke, talk, and move and not the standard grocery store sheet cakes. 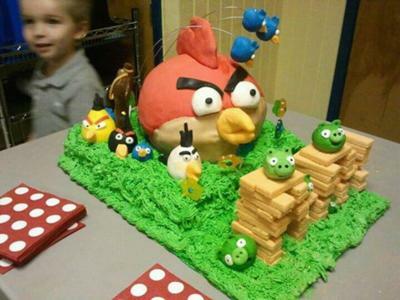 Well that's my Cake and story I hope you enjoyed my Angry Birds Cake too.